Just when there were starting to be too many iPods to choose from, Apple comes along and simplifies the entire range. The new all-singing, alldancing iPods now have colour screens and a few extra features. So what's new? Well apart from looking fresher and brighter than its mono-screen predecessors, the new colour iPod comprises all the features of the iPod photo, which is now no more. 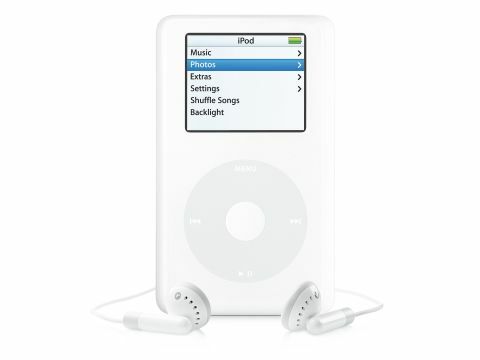 This means Apple has changed its range of iPods to just 20GB and 60GB versions, with the iPod mini at 4GB or 6GB. Those are your choices, and which one you choose from now on will probably depend on weight rather than look, and whether you want to carry your photos around with you or not. The new iPod 20GB has a 220x176 pixel display, which means you can click your way through the menus effortlessly and quickly. When it comes to viewing your photos, not only are they now in full colour, but you are also able to view 25 fullcolour thumbnails at a time and create a slideshow. Viewing your individual shots is also easy, just select one using the click wheel and you're away. You can also connect your iPod to your digital camera if you buy an Apple iPod Camera Connector (£19). Okay, so it's not included, but it does mean you can copy across images from your camera and view them on your iPod. Listening to music is almost identical to before, except for the addition of being able to view album artwork - you do need iTunes 4.9 installed on your Mac, though. The currently playing album's cover appears next to each song, which is a nice visual. 20GB gives you 5,000 songs, which is roughly 500 albums. That's enough music to be played constantly for 14 days, without repeating a single song. The battery power is also impressive, enabling you to listen to your music for up to 15 hours in our tests, with recharging taking five hours. And if you're a keen podcast listener, you will be pleased that Apple has incorporated a new Podcast menu into the new iPod, which makes finding and listening to your favourite radio shows much easier. At £209, you're definitely getting a good deal with the iPod 20GB. In the box you get a USB 2.0 lead, Apple earphones and an iPod USB power adaptor but that's your lot; there are no hidden extras here, which is a shame considering the iPod mini comes with a handy belt-clip. Sadly, the days of getting an iPod dock as standard are long gone. A FireWire cable is also an extra, so if you don't have a Mac with a USB 2.0 connection, prepare to fork out another £15. If you're unsure which iPod to buy, look at price. If price and portability are high priorities, the £169 iPod mini 6GB wins hands down. But the iPod 20GB does have a lot more to offer. As previous iPod incarnations go, it's lightweight at just 167g, and also svelte at just 0.63 inches wide, opposed to the plumper 0.75 inches of the iPod 60GB. The back of the iPod is beautifully shiny, but it doesn't take much for this to incur scratches; invest in a good quality protective cover to keep it looking newer for longer. Of course, the new iPods aren't just about music or photos; you can also copy text documents, Excel spreadsheets and PDFs onto them. In fact, you get the impression that Apple is moulding the iPod into a PDA rather than a MP3 player.